This week, Grandpa Stauffer went to heaven in the loving embrace of his Savior. He had battled cancer for years, and was finally completely and totally healed in the arms of Jesus. I lost two Grandpas and one Grandma between the ages of eleven and thirteen. My remaining Grandma moved across the state, and she passed on right before my wedding. I married into a wonderful family, Marty had yet to lose a Grandparent until this week. Grandpa Stauffer was everything you would want in a Grandpa. He welcomed everyone in with a hug and a smile, I became one of his grand kids almost instantly. He treated me like his own, the entire family is that way. 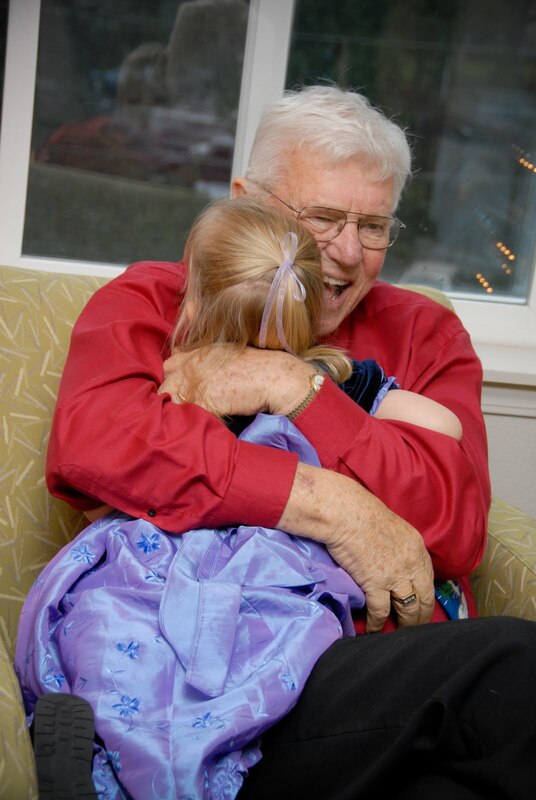 Grandpa has created a legacy of love within this close-knit family. We buried his body on Thursday. It was immediate family only. There were fifty of us there, and most of the young kids were not in attendance. The Stauffer family in this community is huge. He had five children, sixteen grandchildren, and thirty great-granchildren, with two more currently cooking and many more to come. All but one is still in the state, and the majority are still in the county. He built a close-knit family by having Stauffer Sunday on the second Sunday of every month. We all gathered for dinner, and Grandpa would gather us all in the living room and talk about what he was studying in Bible study, what he had read recently, or whatever the Lord had put upon his heart to talk about. On your birthday month, you would give a report on the past year, what you learned, where the Lord was leading you, and how your life was going. He cared about us, he wanted to know about our lives, and he prayed for every single one of us all the time. Grandpa taught us that your priorities should be in order- God, family, then work. This family-focused lifestyle has shown itself so many times, I cannot even think of all the times the family has pulled together to help one another out. Truly, Grandpa taught us how to raise a Christian, God-centered family. None of us are perfect, there have been mistakes made, but forgiveness always follows. Because that's just what Christ does. Grandpa showed his love to everyone, and he proved that love and affection should not be hampered by what people might be thinking. He would hug you if you needed a hug, hold on tight, and whisper in your ear if he thought you needed it. He would sing hymns if the mood struck, regardless of where he was. He didn't care. Loving God was first, and God's approval was more important that man's. I hope to emulate that someday. Marty and I were talking, Grandpa and Grandma had four children who had children of their own (their son Karl was killed in an accident in his teen years.) They now have offspring totaling seventy. Marty and I have four kids. We could be Grandma and Grandpa Stauffer someday. I only hope I can handle the responsibility with the same love, grace, and kindness that Grandpa showed me, and continue the legacy that he built within this family. Grandpa, you will be dearly missed, but your legacy will live on. I am so incredibly proud to be a Stauffer because of the things you showed me and taught me. Thank you for loving me like I was your own grandchild, thank you for being my Grandpa for ten years. Goodbye for now, I look forward to the day we get to see each other again in heaven, and I'll hug your neck and tell you again how much I love you. Grandpa and Emma, Christmas 2007. This is Grandpa's love. Me, on the phone with my darling husband, whom I adore: "I love you, you know that, right?" My darling husband, who knows me so well: "Uh-oh, what did I do?" Me: "You know last weekend when I was gone and you decided that it would be a brilliant parenting decision to have a water fight with the kids and spray them with the hose, regardless of the fact that it was January?" Marty, laughing: "Of course I remember! That was awesome." Me, unimpressed with his laughter: "Yeah. Well, did you know that you didn't undo the hose from the faucet, even though it was in the 20's last night?" Marty, still laughing: "Oh, my bad." Me: "Well, I had no idea that there was a hose, hooked up, turned on, and sitting on the patio. So when we got home today, and I let the boys play in the yard while I went inside for a few minutes, what do you think I found when I came out to get them?" Me: "Why are you laughing? You have three soaking wet and shivering boys here, who decided that spraying each other with the hose was a great wintertime activity." Marty, still laughing, and by the tone of his laugh, probably had a few tears running down his face. He might have been on the floor for all I knew: "Bwaaahahahahahahahahahahahha!!! Hoo, I'm sorry, but that's funny!" Me: "Are you really sorry? Because the fact that you are still laughing suggests that you might not be entirely sincere." Marty: "Well, I am sorry. I'm sorry I got caught!" And then he dissolved into another hysterical laughing fit. Truly, I have five kids. A six year old, two four year olds, a two year old, and a thirty two year old who is too big to tackle to the floor and refuses to listen. And that is why I love wine.